what a sweet photograph of your aunt when she was young. how lovely she was. My great aunt Winnie never married, either, but was so loving and generous to her extended family, just like your dear aunt. Lovely photo!! What a beauty! I wonder why she never married...Even in Beaver Meadows, she must have had her chances. She was a beauty, Kimy - right to the end. I knew I liked her from her fancy outfit and her smile, but the felines clinched it! Don't worry about the non-sepia photo; Alan stipulated in the "manifesto" that it could be sepia or otherwise despite the name. Really enjoyed this photo. Did you see my post on Harold Lloyd's silent film, The Freshman? This reminded of that somewhat. Helen was quite the popular name for women before 1940 or so. It was my mother's name, and when one of uncles married a Helen, she had to go by Mary Helen since it was just too confusing at family gatherings. It's a bit odd now to get mail from her now that she's dropped the "Mary" and has my mother's exact name. Great photos and story of your Helen. A special woman, lovely in her youth and as she aged. She was so glamorous and beautiful in such a natural way. That is one huge bouquet -- I wonder if she won some kind of beauty pageant. I can't imagine a photographer having a large bouquet around just for her, so it must have been some special occasion. It is quite a photo. The hair band does say 20's. It is a cool photo. Your great aunt Helen is gorgeous! I just left a comment on Lettuce's blog observing how incredibly evocative these old sepia photos are. Lovely photographs of you great aunt Helen. She looked great, in the 1920s and when she was 95 years young. Both photos are wonderful--there's a real joy in your aunt's face at 95! Great to think of her listening to Bob Marley. After losing my own beloved Aunt Helen last year it makes me happy to see yours so beautifully honored here. Thanks for the words and photo, Mouse! Weren't the bouquets in the 20's just devine. 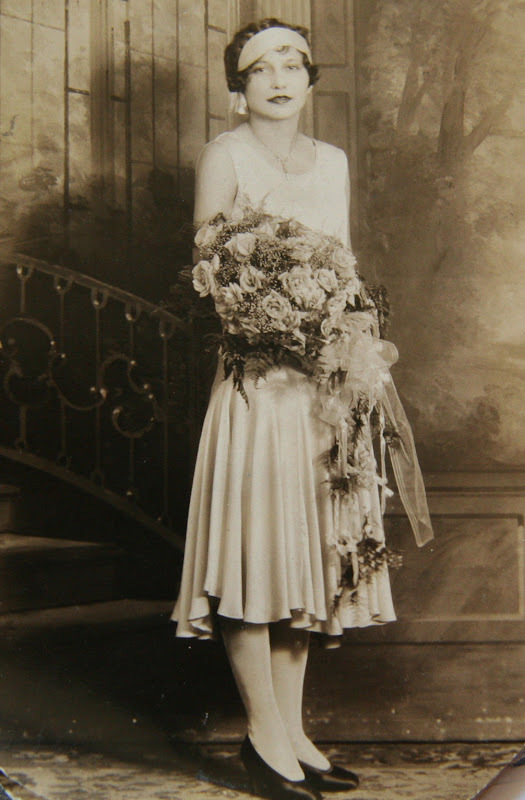 It doesn't seem to matter what the financial circumstances of the bride, she always seemed to have fabulous flowers. Gorgeous dress too. You'd be a fashion icon in something like that today! I'd love to know why she has a sort of 'wedding' photo but never married. Such a beautiful photo of Helen. I so love looking at photos of elders from all stages of their lives, so thanks for including the more recent one, too. And Bob Marley is the man. He's my homeboy from Jamaica, so I remember him when. What A Lovely Smile Helen Had.She Looks Such A Nice Lady.